If you’ve read this blog you know I’m a pop-culture junkie, which means that Allahpundit over at hotair has left me no choice but to wrap my arms around his blog post like Steven Guttenberg would a little baby. Anyone wondering why liberal Hollywood would remake Police Academy should also wonder why liberal Hollywood always goes back to the proven public policy box office bombs peddled by progressives throughout history. 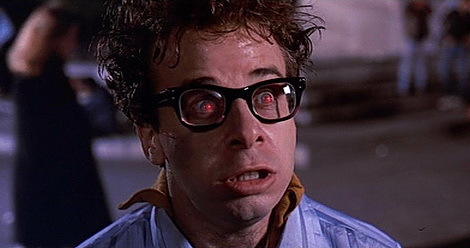 Personally, the majority of the time I look at liberalism as an ideology modeled on the life work of Rick Moranis. Sure, liberals always portray themselves as cool (and they’ve done a good job marketing it, I’ll admit that), but it can be delegitimized if we get a few astute observers pointing out that often times their social experiments shrink things (i.e., the economy), blow things up (i.e., federal deficits), or become monsters with a life of their own (i.e., endless entitlement programs). And sometimes…they befriend the world’s Gozer clones (e.g., Sean Penn’s man-crush on Hugo Chavez). Just because the Ideology of Rick Moranis sometimes cuddles up with creatures from another dimension that could bring about hell on earth, it’s still dangerous to start sliming people as “evil” with whom we disagree. That’s why I stick to things like Barack Obama: America’s Orko. Because when you start demonizing your critics, you turn into Janeane Garafalo and Rosie O’Donnell. Previous Entry Paul Krugman Embraces Ren and Stimpy School of Emotional Economics. Next Entry Tom Hanks Lives in Liberal Echo Chamber Filled with like-minded Cast Aways. Then again, there *are* evil people out there, and refusing to accept that or deal with it appropriately can have disastrous effects as well. If you simply call people evil out of some kneejerk reaction, sure, that’s bad. If a serious review of what they say, what they do, what they’ve admitted that their goals are, how they treat others, etc – and that review leads to an intellectual discernment that they are, in fact, ‘evil’ with ‘evil intentions’, then one shouldn’t shrink from making that discernment, either. I guess it all depends on how much proof someone wants of consistently wrong actions before they will comfortably conclude that said entity has an overall negative effect on society instead of a positive one. The question seems to be a matter of decision. One more stark note on possibly ‘evil’ entities, they prey happily on those who will continually give them more and more slack over time by postponing judgment on the basis that the entities past ‘wrongs’ can be overlooked. This is probably the biggest pitfall of the otherwise helpful virtue of deferred judgment. You make a lot of good points, trace9r. I guess my big beef with using language that would imply someone is “evil” would be that sometimes people who simply aren’t well read enough – who would cross over if approached the right way – feel attacked, and then respond accordingly. For example, I have a lot of moderate friends who don’t really concern themselves with politics. They’re not political junkies like you or I, and the approach I have to take with them is very different than I would if debating someone on these boards. Growing up, for me, the “default” way of thinking was: liberals = good, conservatives = bad. It’s just ingrained from childhood through education, music, movies, etc. It takes a lot of time and patience to bust through that, and sometimes I think conservatives don’t always get it. I am willing to concede it is ridiculous to say that Barack Obama and the Democrats are “evil” because they disagree with me. If only I could get the same consideration from them. Yeah, that’s the problem with relativism (and being “willing to concede”) it puts your beliefs on a moral equivalence with statist beliefs. Soul-searching question: Do you think an Obama, a Pelosi, a Barney Frank or a Stuart Smalley are ever willing to concede that your beliefs are just as valid as theirs? Oh, wait. You answered that already. They don’t even give it a consideration. Notice they walk away with the win? You accept their faulty ideology as legit, and they show others that yours is not due any respect or even a look. We can’t prove the rightness of our ideology if we concede that it’s merely an alternate point of view to the statists’. Their success in promoting such failure of thinking is wholly dependent on our non-condemnation of it as a complete FAIL. We do ourselves and everyone else a huge (and injurious) disservice by letting an ideology we know to be sound be demoted and disrespected while letting a destructive one be promoted as the better alternative. Truth and lies don’t just disagree and still co-exist, they are mutually incompatible. They cancel each other out. There can only be one or the other, or else neither one means anything. This is the essence of relativism, statism and liberal ideology. If it is allowed to be presented as a co-equal to idealogical truth and history, then it actually renders them both as false and not to be believed. Is this not wrong to the nth degree? People really want to be convinced of an ideology’s soundness. They want it to be true. Because then it neutralizes confusion. Two different ideologies that negate each other and cancel out each other’s meaning cannot co-exist. Statists know this, and that is why they want our ideology to appear false; but it can’t be so, because the facts bear it out. People will believe lies, though. That’s why it’s kinda our obligation to tell the truth. That involves distinguishing the truth from lies, not just laying them both side by side and pretending they’re the same. the botnet finds it extremely difficult to not attack Drones and Statists with any club available. the botnet believes there are two levels in the hierarchy of Statism; those that know better but see opportunity for political and personal gain by perpetuating leftism (the crooks), and those whom the crooks control (the drones). the botnet was formerly a drone himself, but gained perspective to see the implication and goal of leftist Statism, and the botnet does not like it. the botnet believes there is a war for the American identity, and to the botnet, any war is one of attrition. The Statist seeks to keep everyone poor and dumb to make necessary a ruling class of Statist crooks. Every day is a new opportunity to lob figurative firebombs at those in the Statist camp to insult the crooks, wake up the drones, and make plain the fact we are at war. the botnet loves his enemies as fellow children of the Creator, but Statism is a crime committed against our children. Those of us that love the founding principles, and wish to preserve them for the future that our children and those yet to be born have the opportunity to revel in Liberty. My friends, We Are At War. I am also grateful to HotAir. Without them, I never would have found you! I appreciated the piece and Rick Moranis is a great comparison! Evil does exist, just not as often, nor where, Janeane claims it does. Thanks, Thare. I’m going to try and write as regularly as possible. If you have suggestion let me know. I’m still pretty new to this, so I’ll readily admit I’m learning the ropes. As I said on hotair (under the avatar watchmen), I just think that conservatives have neglected music, movies, and the entertainment industry for far too long. Ceding such a huge aspect of our culture to the left has hurt us. My goal is to use to turn one of the left’s best weapons back on itself. Except government IS more evil than Wall Street bankers, university professors and media barons (I’ll leave out Pentagon officials, as they are actually part of government, and it’s a tautology that something isn’t any more evil than itself). Only one of the groups on that list accomplishes every single task through the threat or application of violence. Only one of those groups forces people to deal with it. You can turn off the TV, drop a class, or bury your savings in the backyard if you find yourself subjected to an insufferable prick in the media, financial sector, or university. Avoid government, and you go to jail for tax evasion or operating without one of the hundreds of ridiculous licenses you need to earn a living on your own (why, we can’t have just anyone calling themselves an interior decorator now, can we?). To go Biblical, there is a reason Satan tempted Jesus not with wealth, knowledge, or fame, but with political power. Government is an evil. It is a necessary evil, to be sure, and thus there is a place for good people in it. But those who seek to expand its role to fix every perceived injustice they find are most assuredly evil themselves. Evil is as evil does. Therefore, we’ve all been evil from time to time, but I would reserve the characterization “evil” for someone or something who constantly and unapologetically does evil because even good people occasionally dabble in dirty deeds. Now the trick becomes defining what evil is. If you think lending money against security and interest obligations is evil, then banks are evil. If you think participating in risk hedging markets is evil, then Wall Street is evil. If you think ramming government control of health care down the voters’ throats to advance a dependency agenda is evil, then Democrats are evil. Etc. Unlimited government allows evil men to have unlimited power. Government is a monopoly on coercion and violence. That’s why it’s dangerous. We need to treat all government employees as “potentially evil” because that is what they are. Corporations can’t make you do things; governments can….at the point of a gun or under threat of imprisonment. If we give them great powers to do good, they can use those great powers to do evil. It’s not enough to call them incompetent. They (representatives of government) must be put on a short leash due to their procliviity to do evil to the governed.